Many baby boomers considering a move to one of the active adult communities in Florida are looking for more than the abundant sunshine that has drawn older adults to the state for decades. Today’s adults, 55 and older, are looking for a community that will provide a comfortable place to come home to after a day of pursuing exciting sightseeing, boating, kayaking, or hiking opportunities. They also want easy access to a pool, hot tub, and fitness center to help them get the exercise they need and enjoy some camaraderie with neighbors. And, perhaps most importantly, they’re interested in active adult communities that will provide all of those perks without exhausting their hard-earned retirement savings. Travel – Our community is conveniently located near several major highways heading in all directions, plus there’s an international airport and a passenger train station only minutes away by car. Sightseeing – From renowned theme parks to nature preserves, you won’t have to drive far from home to enjoy internationally acclaimed attractions when you live in Hyde Park. Charter fishing and boating – If you’re one of the many people looking at active adult communities in Florida because of the wide variety of aquatic adventures that await you, our Central Florida location will exceed your expectations. At Hyde Park, we take pride in making this kind of active lifestyle affordable for many baby boomers on a budget. Indeed, Hyde Park is more than a place to live … it’s a lifestyle! 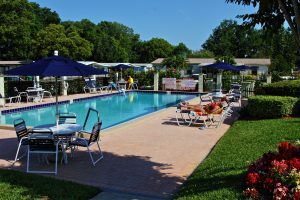 To learn more about how we stand out among active adult communities in Florida and schedule a tour, contact us today.